An unusually high IQ? Wrong. Cooperation and team building over antagonism? Wrong again. Conscientiousness and planning over spontaneity? Not quite. It turns out none of these correlate strongly with entrepreneurial ability. What does, instead, are qualities like interest in novelty, being able to think on your feet and, believe it or not, age. We know all this thanks to data compiled and constantly updated by the Founder Institute. A radically new idea in itself, the Founder Institute is a school/incubator of sorts with chapters in Silicon Valley, San Diego, New York, Boston, Houston, Brussels, Berlin, Paris, and Singapore. Its goal is to train entrepreneurs in the skills they need to start 1,000 companies a year. This is entrepreneurship at a tremendous scale. Using seasoned entrepreneurs as teachers (disclosure: I guest lecture there) is not a new concept. What's different about the Founder Institute is the data it collects and funnels back into its admissions process. As Michael Lewis described in "Moneyball," statistics, data mining, and predictive analysis -- mathematics seeking to remove human bias -- often trump the best baseball scouts in finding sporting talent. It turns out the same is true for entrepreneurs. In a one-hour, comprehensive battery of tests, the Founder Institute measures intelligence, aptitude, and psychology's big five personality traits. Each student receives a score of 0 to 5 (higher is better), predicting how well he or she will do as an entrepreneur. As the course proceeds, students give each other 360-degree feedback on, for example, the quality of a business idea (1 being a vague idea without a clear value proposition, 5 being the most compelling idea you've ever heard). It turns out the peer reviews match uncannily with initial test scores. At graduation, students who have incorporated a business, started development or launched a product receive high exit marks. Each semester, successes are fed back into the weighting mechanism in the test, so it becomes more accurate with each passing semester. Data collection doesn't stop when training is over, either. Every six to 12 months, liquidity events (sale to a larger company, IPOs) for each group are fed back into the system, giving each and every class a predicted future value. The result is a test whose predictive ability ranks among the top 5% of social science tests. So what has this test found out so far? Initial hunches about traditional IQ, meticulousness, and cooperative spirit turned out to be false. There's no statistical correlation to genius level IQ, for example. It turns out, the three statistically significant qualities are openness, fluid intelligence and age. Openness measures the desire for new experiences and is often associated with aesthetic appreciation and a passion for art and literature. Fluid Intelligence is measured by showing budding entrepreneurs patterns of numbers, shapes or geometric figures, and asking what comes next in the sequence. It gauges the ability to quickly learn new rules, keep them in short-term memory and apply them instantly. In other words, to think on your feet, take in a massive amount of new information, and react appropriately. The last trait correlated to success as an entrepreneur is age, where older correlates more highly to bringing projects to completion. First, the Founder Institute appears to have developed a test that any population, any city, university, or country could use to determine who among them has the best shot at succeeding as an entrepreneur. Second, while venture capitalists encourage their portfolio companies to pioneer new ways of doing things, operations have barely changed in 30 years. They rely primarily on networking, chance meetings and gut analysis of companies. If I were a venture capitalist trying to differentiate from 500 other nearly identical firms, developing a quantitative test that improves year after year is exactly what I'd be doing. Data mining and behavioral analysis have had great success when applied to ad placement, recommendation engines, and even sports. Isn't it time we start using new techniques to evaluate that most mercurial of entities: other people? 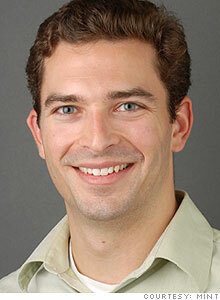 -- Aaron Patzer is the VP & GM of the Personal Finance Group and Founder of Mint.com.